Place on your dessert table, cue the ooohs and ahhhs! There are occasions where a dessert maker wants to outdo themselves, and the holidays are one of them. From elegant cakes to a parade of seasonal pies, sweet tables are often a feast for the eyes, first, especially now. Profiterole towers often steal the show; this chocolate cream-filled profiterole wreath would steal the show from them too. She notes that you can make your own profiteroles, but that if you're out of time or energy, you can still make this beautiful wreath using store bought profiteroles, found in larger grocery stores in the freezer section. Either way, you’ll be proud to place this wreath out this season, and your guest will be thrilled to start popping. To make this wreath as shown, you will need approximately 120 puffs roughly 1.5 inches in size, and some Dark Chocolate Ganache, bonbons, fruit and a little edible gold for flair. For assembling, you’ll need at least a 16-inch platter. Note: This is best assembled the day you're going to eat it. Make ahead: Profiteroles can be made ahead, frozen, and then filled on the day you need them. Refrigerate after filling. You can also use store-bought profiteroles, found in larger grocery stores in the freezer section. Bring the water and the butter to a boil in a medium pot on the stove, then lower the heat to medium. Add the flour and beat vigorously with a wooden spoon until the mixture has thickened and dried slightly, leaving a residue of flour on the sides and bottom of the pot. Transfer the flour mixture to the bowl of your stand mixer, fitted with the paddle attachment. Turn mixer on medium high and add the eggs, 2 at a time, mixing well after each addition and scraping the sides down before adding the next eggs. You should have a beautiful, smooth batter when you're done. On a baking sheet lined with parchment paper (use a tiny bit of the dough in each corner of the pan to hold the paper down), or silicone liner, pipe or drop from a teaspoon approximately 1-inch balls of batter. These will puff up as they bake, so space them about an inch and a half apart on the sheet. Prepare an egg wash (whisk the egg in a bowl) and brush the tops of each puff. Use your pastry brush to guide the puff into a ball shape if it's uneven. Place cookie sheet into oven, one batch at a time. Do not open oven while baking. Bake for 15 minutes, then reduce heat to 325F degrees and bake for 10 minutes more. Meanwhile, keep the remaining dough at room temperature, covering whatever doesn't fit into your pastry bag (if using) with plastic wrap. When the first batch is baked, continue making and baking the puffs with the remaining dough. Allow to cool, then fill with the pastry cream. If making ahead, keep refrigerated until use. With the addition of instant espresso powder, you will find that the chocolate flavour really blooms. In a large mixing bowl, whisk together the egg yolks, sugar, flour, cornstarch and espresso powder. In a saucepan, bring the milk and cream to a simmer. Whisk in a cup of the heated liquid into the eggs, pouring slowly and whisking to incorporate fully. (This helps temper the eggs so that they don't scramble in the next step.) Now pour the egg-milk mixture back into the saucepan with the rest of the hot liquid. Cook the pastry cream over low heat, stirring constantly, until thick and bubbling. Remove from the heat and stir in the dark chocolate until melted. Transfer pastry cream to a bowl. Press plastic wrap onto the surface of the cream to prevent a skin from forming. Refrigerate until cool. Make ahead: Pastry cream will keep, refrigerated, for 4 days. Next, fill your puffs. Using a pastry bag fitted with a small tip, poke into your profiteroles and squeeze in a scant tablespoon of pastry cream into each puff — or until filled. Refrigerate until serving. To hold your wreath together, use some Dark Chocolate Ganache as your "glue". This is a wonderful sauce that can also be served warm on the side for people to enjoy with their dessert. Equal parts chocolate to cream make this a super simple recipe to remember. Bring 1 cup whipping cream to a boil, then pour over the chocolate (into a heat-safe bowl). Allow to sit for a minute. Whisk until smooth. 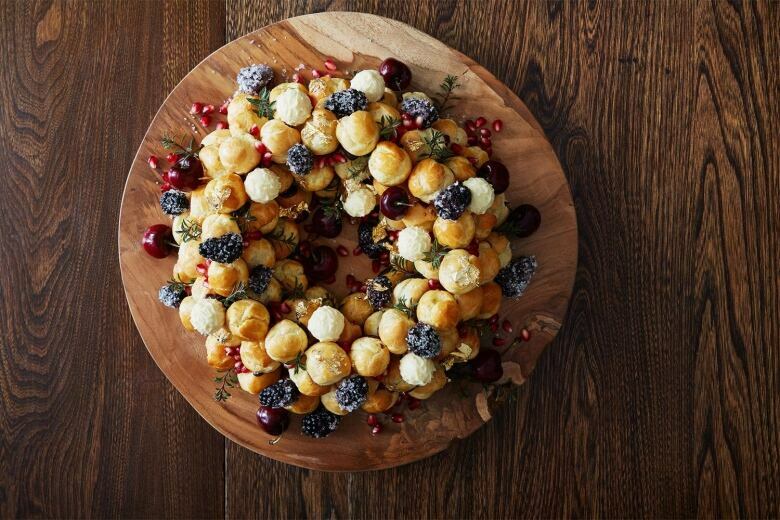 Assemble the wreath on a 16-inch platter. Dip the bottom of the profiteroles in the ganache and arrange in a circular pattern, 3 rows wide at the bottom. Repeat with the next layer, 2 rows wide, and then and single row for the final top layer. The idea is to form a pyramid shape, narrowing at the top. Decorate with truffles, blackberries rolled in coarse sugar, pomegranate arils, and edible gold leaf if you're feeling extra fancy! If you're having a hard time getting the fruit to stay where you want it, you can use a toothpick to help keep it in place. Serve with warm chocolate ganache if desired. Tip: Edible gold leaf in loose leaf sheets are available at specialty cake decorating shops like McCall's or Flour Confections. It's also available on Amazon — just be absolutely sure that it's pure gold. With a soft paintbrush, pick up a little piece of the gold and place it onto the wreath. Do this in a draft-free room as gold leaf is so fine that it will want to fly away as you're working with it. Servings: Makes one stunning wreath! Presenting… CBC Life's 12 Pies of Christmas!